I leave within the month to return to Australia. I have this acceptance that I have to leave. I want to go home, but I wouldn’t mind if I stayed here for another 6 months. It’s strange for me to explain how I feel. It’s not like homesickness where I would cry and feel sorry for being in such a stupid town in stupid old Germany full of stupid people with stupid ancient buildings. Now I just feel like, I know what it’s like to live in Bavaria. (I say Bavaria because it is the richest state in Germany) and I think I’d be happier in Australia. But I also like the way I’ve seen how different things are here and how they should maybe be implemented back home. I have this feeling that from seeing how other people do things I can make my country better. I don’t know, it is this strange sort of patriotism. I think that Australia is one of the best countries in the world, and I’ve seen some examples on how to make it better. I’m afraid of that “I’m not from here anymore” response to returning. I don’t want it to be like that. I want to be able to just go back to the familiar. Don’t get me wrong. Things aren’t strange and unfamiliar here, not anymore. It’s just that I feel I’d be happier with the stuff I’ve been familiar with for 20 years than what I’ve been familiar with for 6 months. I know,, it’s not really a fair time to compare, I also want to come back here later in life, but right now I feel like I could be accomplishing more back in Australia. P.S. I also really miss sandwiches/salads/small lunches. Here a hot, cooked lunch is really common. Took me a while to notice that, but the “Mensa” or cafeteria has mostly only warm dishes, and everyone seems to think it is normal… I also miss our type of bread. I can live with bread here, but it’s mostly a choice of sourdough or really crappy “America bread” which is stale, preservative ridden, horrible tasting bread that looks like what you can get in Australia. I also am a bit of a food snob, so I can’t wait to walk into Woolies and have such selection of brands I know and fruit and veg from the next state not South America (not that it’s a problem, I just like buying Aussie grown) and I won’t miss the ability to know where all my food comes from (here nothing is labelled unless it’s something from Aldi that they sell in Aus). Probably only 3 foodstuffs I will miss from here are Kaiserbrotchen, Spatzle and Chocolate. Beer and it’s quality and diversity and cheapness is also a problematic farewell. Actually this isn’t about Eurovision – except my friend from the US has no idea what it is. Me and some British exchange students are going to educate her tomorrow night. I have about two and a half months left in Germany and I thought I should list some differences. This will probably sound like a rant but really, nothing much bothers me about this country. If it does I’ll say. There is a main topic that I’ve been following in Australia and that is about the R18 ratings for games. I like how Germany has done their’s here, a photo from Saturn, kinda like JB HiFi but bigger with fridges etc. You can easily tell which games are for what age group. No little kids getting their mittens on the other games. 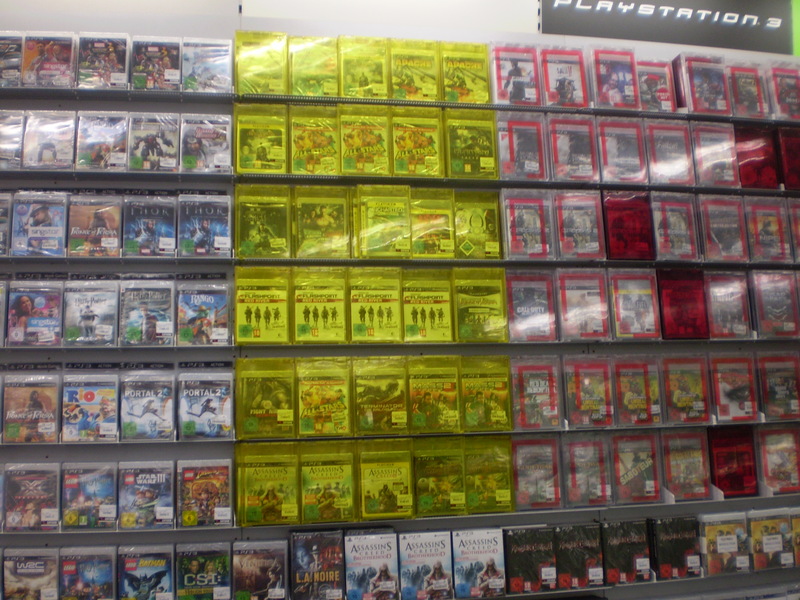 Downside – in Germany they are really touchy about violence and such, so sometimes games are edited or not allowed to be displayed or advertised in the store. That is really stupid as some times the games are altered to not give a realistic example of what happens if you shoot someone. Despite the price of the tickets, DB is worth it, especially if its group travel. They have many excellent deals. The Bayern ticket is quite awesome. With it you can take all local public transport in Bavaria, for up to five people. And weekend travellers can get a Schönes-Wochenende-Ticket for all local transport all over Germany for 5 people or for parents and their unlimited children under 14. We need these. For 50c a cup! 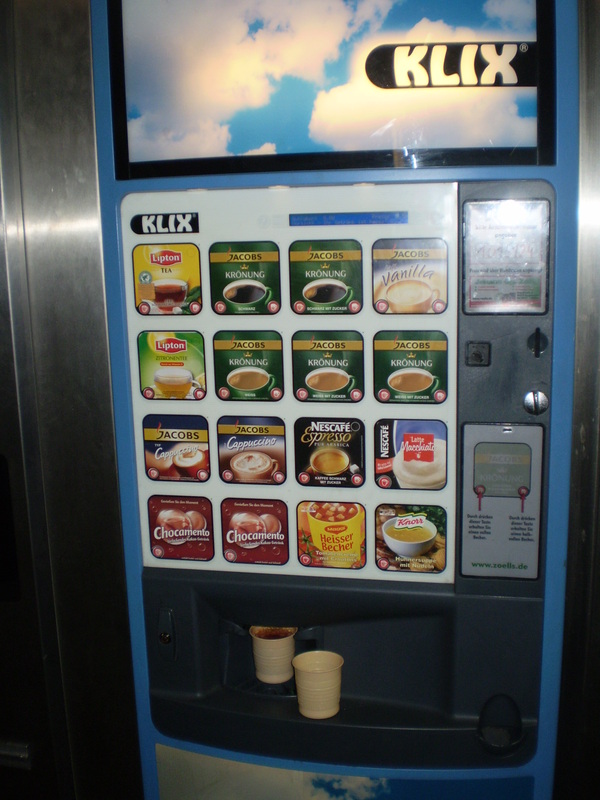 On all the major stations one can get one of these 50 cent cups of tea/coffee/hot chocolate/soup. It’s an excellent idea, especially if you are on a platform, wet, freezing in -1 degree celsius on your way home from a concert at 11pm. But then again, all of DB makes sense, its relatively clean, on time (in the day time) and I think you get what you pay for. Here in Bayern they have only just changed the laws so there is no smoking in bars. It’s weird to watch people leave their handbags on their tables with their beers to go outside to smoke. So many people smoke. There are smoking vending machines for crying out loud! One in my building (don’t know if it works) and two within a 3 minute walk. They don’t sell lighters unfortunately. That would be funner. I find it very safe walking around Erlangen in the middle of the night. I wouldn’t walk from the other dorm building a block away to here in the middle of the night back home. God, I’d be afraid of being attacked going for a walk around my block. It might be because people are friendlier or I don’t know. It seems that the Franconian’s are willing to help you if you ask for it. Otherwise they just ignore you. One thing I especially love is the amount of bicycles and that they have right of way. 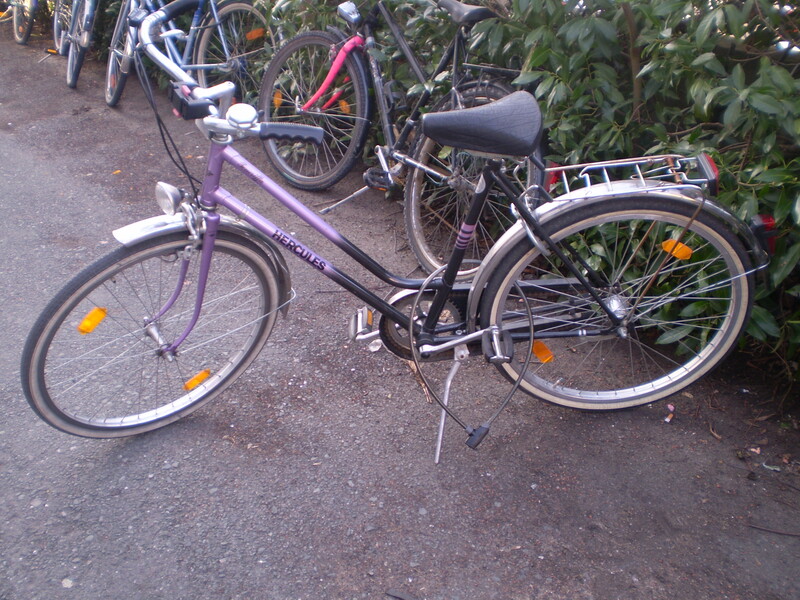 The thing I love more so is my bike Hercules, and that I don’t have to wear a stupid helmet. Might’ve mentioned that before. But it is seriously the best thing. I rode 12 kms the other day. I better be fit by the time I fly out in the last week of July. The shops are not allowed to open on Sundays in Bayern so that means you have to have all your food organised by 8pm Saturdays. After working in Woolworths on Sundays I understand from that point of view, but when I run out of something I’m craving, or my milk goes off I really don’t like it. And it’s a major trek to the petrol stations and they cost so much. Here in Germany you can get an Austrian delicacy of the scnapps kind. 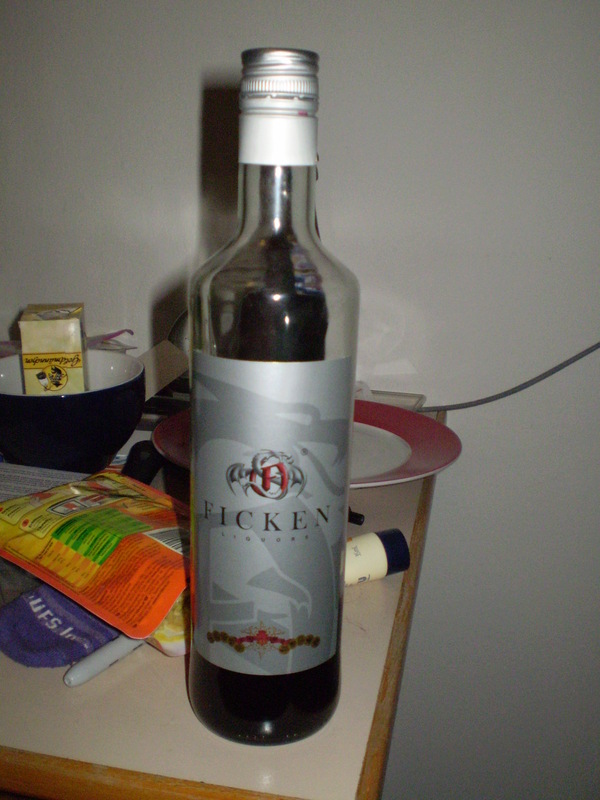 It’s called Ficken, the PartyScnhaps and it rocks. It tastes like Ribena but alcoholic and you can only get it from the local “Adult” store or a supermarket 1.5km ride away. For 11euro its pretty damned awesome. I’m going to have to find a way to import it. Yeah, don’t say Ficken around many native German speakers. It’s kinda rude. I love the attitude to alcohol in this country. Actually the attitude to many things is “If you’re an idiot you pay the price”. No nanny-state here, except getting your license and the violence censorship thing. It’s a lot nicer. Everyone seems to get drunk here, yet I’ve seen one almost fight. In all that drinking you’d think there’d be more. I think it’s because people are taught to drink properly, like one with dinner and whatnot. Not like home where it’s like “you must not drink, you will die!” except when you are 18, then everyone goes nuts. The legal age for beer and wine here is 16, depending on the situation eg not in certain bars. That’s what is annoying. Germany has made me realise that there is too many safety nets for morons at home. I say, let them kill themselves. Easter and spring here are pretty big. For instance, every shop had hares or eggs. Some still have hares. 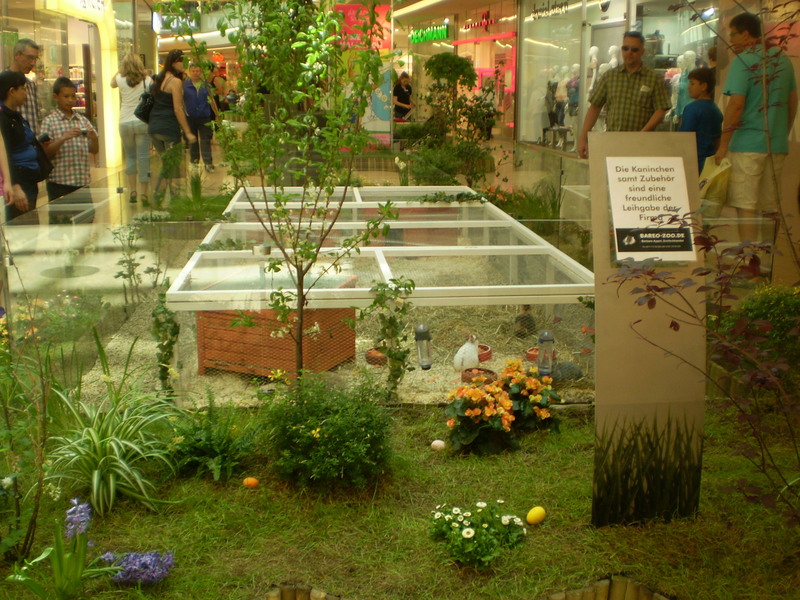 The major shopping mall had real bunnies. So yeah. That’s all I can think of at the moment. I’ll be back later. 7am wake up to apply for my residency permit. 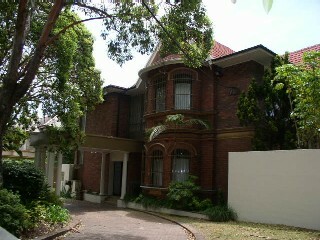 We had to get to Woollahra between 900 and 1200. O fun. We were gone for four hours, 15 minutes were spent in the German Consulate. I hate to sound cliche’, but the lady behind the desk was very efficient. And nice. I watched her conversation with some German nationals. All I could understand is that she could not do something, then asked when the passport ran out, to which the national replied the first of march. I felt like such a loser. I gave another lady an empathetic smile when she struggled with the door to get in, she said something in German and laughed so I did one of those “o yeah” laughy-things. I still have no idea what she said. I guess this is my first experience of language barriers where I’m the odd one out. On the plus side my application was all good and I can expect the permit in 4 weeks. I leave in 6. Not long now. So exciting.